Possibly the most well-known single piece of advice for any aspiring entrepreneur is the age-old adage of “Location, location, location.” Choosing the right spot can make or break a restaurant regardless of the food’s quality, the chefs’ talents, and the ambience of the interior. If you manage to find that perfect location however, the next step is negotiating a restaurant lease agreement with the property owner. As both parties will be seeking to minimize risk, this presents possible conflicts of interest. Since business owners build successful, affordable franchises through negotiation, this process is crucial. By considering the following strategies, you will be better suited towards settling on an agreement which ensures you can maintain your business while keeping the offer attractive for the landlord. Knowing what to expect is a fundamental aspect of any informed purchase, so it’s especially important that both parties agree on the details. The condition of premises section should include exactly what properties, utilities, and existing equipment are included with the lease as well as their working conditions. Depending on where the lease is located, such as a shopping mall or center, certain aspects like dining and parking areas may be shared with other tenants. If the location you want is next to an office furniture store, meet with that store owner to discuss designating parking spaces. Push to ensure this section is in writing with perfectly clear verbiage to avoid any possible complications between the landlord and any neighboring tenants. Once it is, go a step further and request the commercial history of the property; it may reveal some information which changes your mind or strengthens your decision. One of the most difficult preparations for any restaurant that plans on including alcoholic menu items is obtaining a liquor license. The process and response time can vary greatly from state to state, so make sure to be diligent in your research. During the lease agreement, there are steps you can take to give you breathing room should any permit process become complicated. Agreeing on a permit contingency will give you options not just for liquor license issues, but for any other necessary permits or licenses. These options can range from delaying the start of business to a complete termination of lease. To determine the proper contingency plan, you will need to make some important considerations on how essential these aspects will be to the success of your restaurant. Besides monthly rent payments, tenants are normally expected to pay additional costs related to the maintenance and upkeep of the property’s designated common areas. These costs are referred to as common-area maintenance, or “CAM” charges, and are typically calculated on per-square-foot basis. These can include costs of parking lot or walkway repair, utilities, & property maintenance and are added to the cost of rent per month. While you can’t avoid these extra expenses, you can negotiate a number of factors regarding them, such as what percentage you are responsible for and limiting exactly what defines a “common area.” The room you have here will obviously vary from landlord to landlord, but insist on establishing a cap. A cap protects you by setting a maximum amount that CAM charges can increase per year. This amount can be percentage based or more exact, and it may exclude certain items. Furthermore, a cap may be cumulative or non-cumulative. A non-cumulative cap is more beneficial to you as a tenant as it ensures the agreed upon cap is consistent regardless of previous years’ increases. 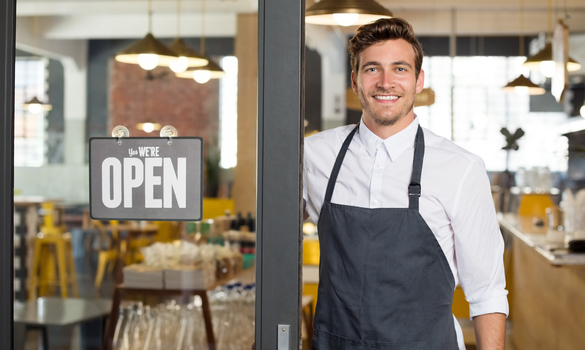 Competitors opening in your area of business is always a valid concern, but you may not be completely powerless against it depending on the location of your lease. You never know when a smoothie franchise will open a location down the street from your restaurant that also sells smoothies. When negotiating for space in shopping centers, strips, or malls, push for security in the form of exclusive use clauses and kiosk protection. Such a clause represents an agreement by the landlord that he/she will restrict future businesses that can threaten yours. This area of the negotiation will be one of the most contentious, as limiting the types of businesses affects the landlord’s potential profits. The scope of an exclusive use clause can be broadened or narrowed to reach a compromise that both parties find satisfactory. If a landlord refuses to restrict the future possibility of other restaurants, try to limit the exclusivity of the clause. A landlord may be more receptive to limiting the style of restaurant and might therefore be more inclined to protect your possible Southwestern Grill if they still reserve the right to lease to an American Diner two storefronts down. As difficult as it may be to imagine, it always pays to plan for the possibility of underperforming. Whatever the case may be, if it becomes clear that the profits are not covering the expenses, you will need to consider cutting your losses. Give yourself a possible out during the negotiation process by agreeing on a gross sales termination right. This clause allows the tenant to terminate their lease based on a number of pre-negotiated parameters. The base agreement will involve a minimum annual gross sales to be met, but it will also include several other factors. One key discussion point is a measuring period, or the minimum amount of time required to meet your sales threshold. In order to minimize losses in the event of low sales, try to lower this period as much as possible but expect a 2-3 year minimum. Equally important as determining a sales threshold is the agreement of the fee for early termination. A properly negotiated gross sales termination right is beneficial for both the landlord and the tenant, protecting both from incurring continued loss on a less-than-successful venture. A restaurant lease agreement is a legally binding document, so failure to adhere to it can result in serious legal consequences. It’s pertinent to ensure that every part of the agreement is clear, understood by both parties, and most importantly, is in writing. This guarantees that all the work you did during the negotiation to protect your investment is backed by law, and no matter how amicable the process goes, this piece of mind is still invaluable.